Traditional community dances have been part of our American culture for over two centuries. Although they've waxed and waned over the years, they have always been with us. They are the traditional contras, squares, reels, and circle dances which your grandparents, and their grandparents, enjoyed. They've been kept alive in Grange halls and church basements, in school gyms and ballrooms, often just below the cultural radar of our news media. They were community events, where young and old, couples and singles, could come and participate. There were no lessons required, or fancy costumes. All the dances were walked through so that all who wanted to could join in. There was a band and a caller, and maybe a potluck ahead of time. Beginning in the early 1950's there was a renewed interest in square dancing which evolved into the modern square dance movement, emphasizing difficult moves, elaborate costumes, dance clubs, etc. During this same time period, many of the traditional dances began to wane. In many communities, they died out, or were replaced by the club dances. Then, in the late 50's and early 60's, there was a huge revival of interest in folk music in America. Many young people especially, were learning to play acoustic instruments  guitar, banjo, and fiddle. They were searching out the older musicians and learning from them. Folk Festivals and Bluegrass Festivals were springing up everywhere, along with jam sessions, sing alongs, and open stages. So what does a great fiddle tune make you want to do? Why? Move your feet, of course. But the familiar rock'n'roll moves didn't seem just right. Pretty soon, many young people rediscovered the traditional dances. 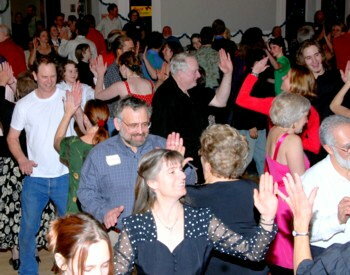 The New England contra dance was the greatest beneficiary of this renewed interest in folk music. In New England there were still many active community dances, and there were many young musicians interested in learning these traditional tunes. Soon young dancers and musicians became regulars at the local dances across New England. When young people who had learned these dances moved to a new community where there wasn't a dance, they started one. If there was a dance, they joined in. Soon the traditional square dances started incorporating more contras into their programs. By the early 1980's, there was a live music dance in just about every large or medium-sized city in America. And in many smaller ones. This represented a great revival for the traditional dances, but these dances were changing, too. In many cases, particularly where a new dance was started from scratch, they danced mostly contras. There were two reasons for this: First was the growing popularity of the New England contras. Secondly was the demand for new callers. When a group of dancers wanted to start a dance in a new community, they first had to find musicians. Then a sufficient number of dancers. And then a caller. Frequently the caller was one of the dancers who had learned to call a dance or two. Or one of the musicians, who wanted to make the dance succeed so that there would be an opportunity to play all these wonderful tunes for an appreciative audience. Since contra dances are much easier to learn to call than squares, these new callers started with contras. Most of the contemporary American community dances now feature more contras than squares. These traditional dances have been tenacious in their need for live music. That's simply part of the excitement of the event! It's homemade, it's traditional, it's low tech, it's interactive  the dancers and the musicians together making it happen. In a high tech society, it's refreshingly old-fashioned. I think this is part of the appeal to the current generation of dancers.